The image of Daniel Defoe’s Robinson Crusoe and Man Friday on the remote castaway island is an iconic image in literature. John Walter (1738–1812), founder of The Times, purchased a patent for a new method of printing from logotypes (i.e. founts of words or portions of words, instead of letters), and printed this 1785 edition of Robinson Crusoe using this method. The frontispiece he commissioned for it is an important one, because it was the first instance of the elevation of this classic scene to frontispiece status (Blewett, 1986). Drawn by the Boston-born Mather Brown (1761–1831), the image was engraved by Robert Pollard (1755–1838), an English engraver and painter who specialised in naval and sea-battle scenes. 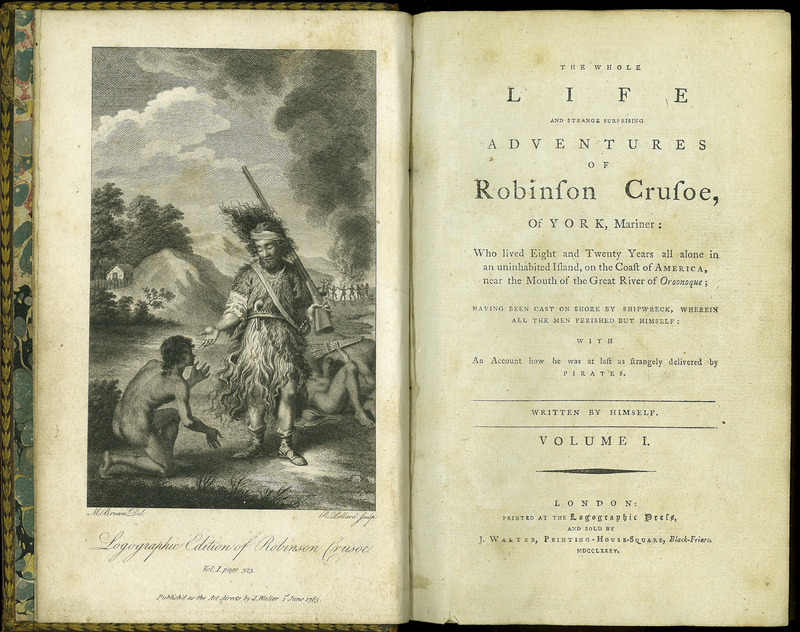 Daniel Defoe, “The Whole Life and Strange Surprising Adventures of Robinson Crusoe, of York, Mariner,” ourheritage.ac.nz | OUR Heritage, accessed April 26, 2019, http://ourheritage.ac.nz/items/show/10698.